Whoa! Wait a minute! Ever the same screen, different movie! In the earliest time . . .
Oops! No, not that early! Let’s start over . . . The year was 1978 when the first satsangs were held in a SAT Temple, only it was not called the SAT Temple in those ancient days. 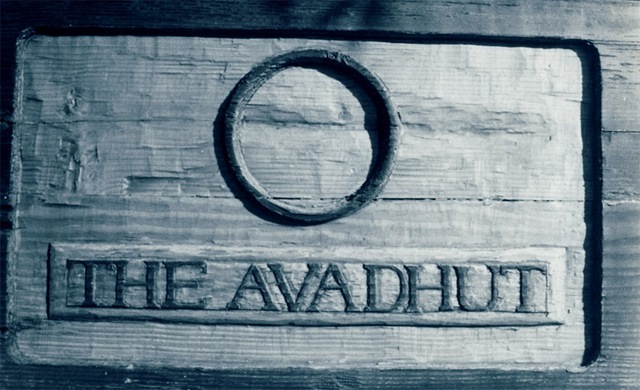 It was called The Avadhut Ashram. 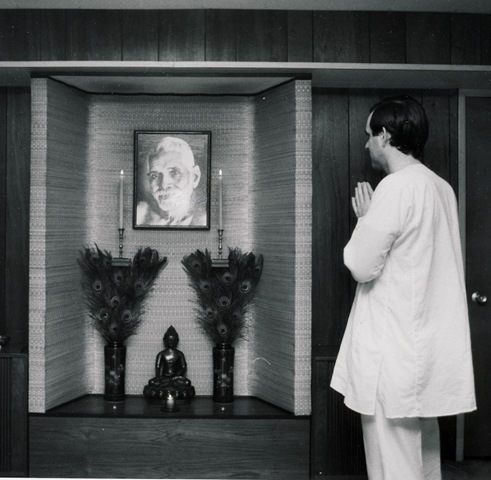 About four years earlier from 1974 onwards, satsangs were held among a small group of friends and visitors that would gather together with Nome to meditate and share experiences of Bhagavan Sri Ramana’s teaching of Self-Inquiry. These gatherings were held in a small apartment and in a house both of which were located in San Francisco. 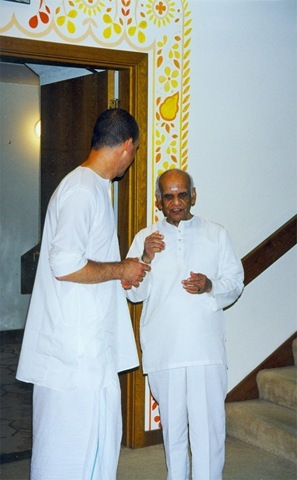 As the number of Ramana devotees coming to satsang grew, either through learning about it through a poster or by being invited by a devotee already attending, satsang was moved to the house of some devotees, located in San Bruno, high on a hill. O.k., not that high of a hill. 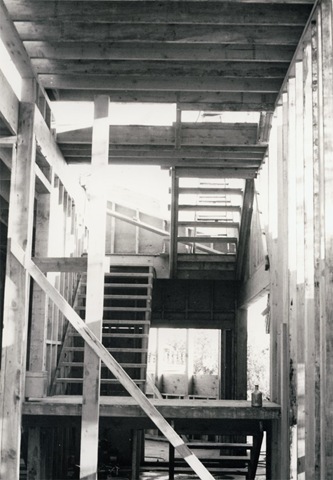 Would you believe on a steep incline on a suburban street? Satsangs were solely held here in the semi-subterranean satsang hall between 1978 and 1981. 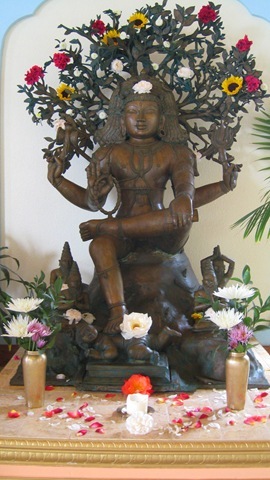 After that, satsangs were also held in the living rooms of the homes of many different devotees and other facilities such as the waiting room of a chiropractor’s office (does anyone need an adjustment from the unreal to the real? The way to supreme alignment?) and even rented space in a karate dojo (how about a wallop into the Absolute!) 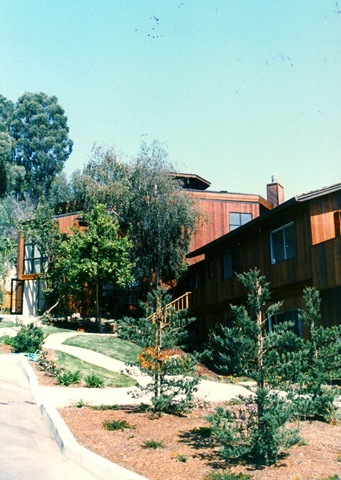 They were held in Boulder Creek, several places in Santa Cruz, San Francisco and San Bruno. 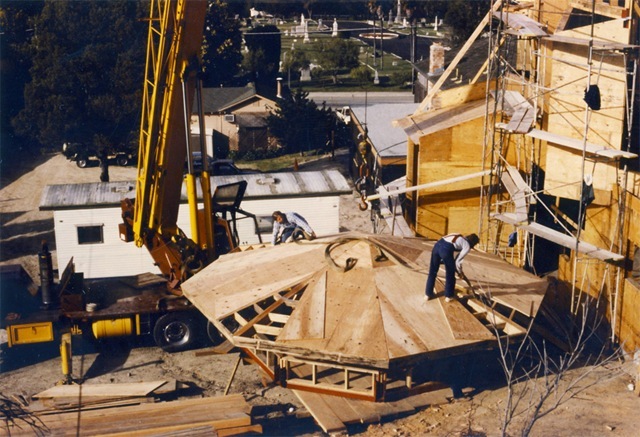 The altar in San Bruno, built by devotees in 1978. 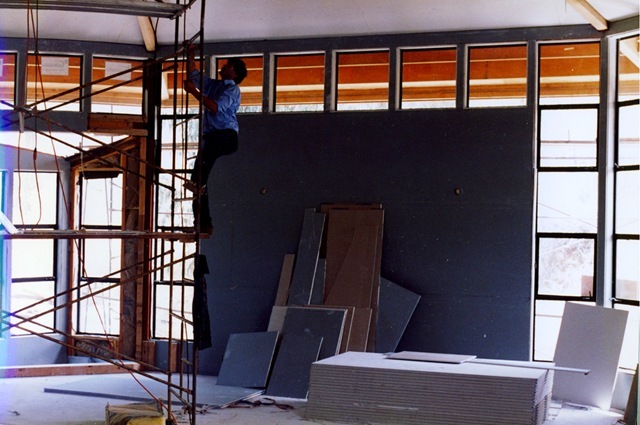 This is Eric in the early 1980’s standing in front of the altar. This altar resides in his home today! Around 1984, devotees realized the need to acquire a more permanent place, a home of spiritual Truth. 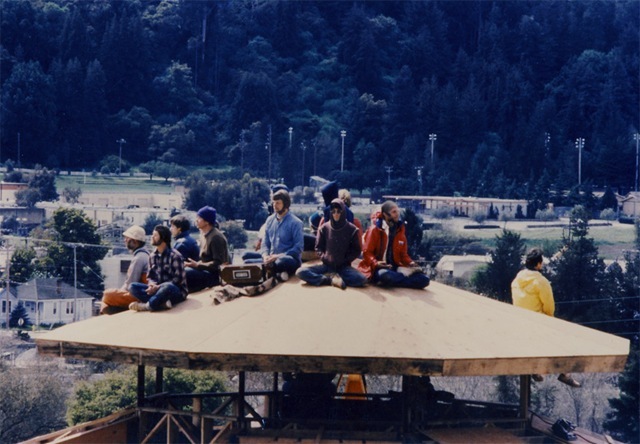 A few devotees at the time suggested finding a place in Santa Cruz. 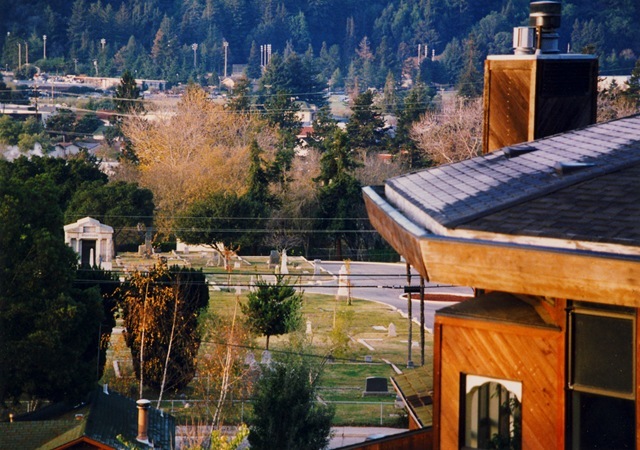 At that time, Santa Cruz was a small town . . .
. . . and seemed like a very good place to make a home for Bhagavan Ramana’s teaching. A house was procured. We know it as the “main house” on the SAT Temple grounds. Some devotees lived in this house taking care of organizational needs. 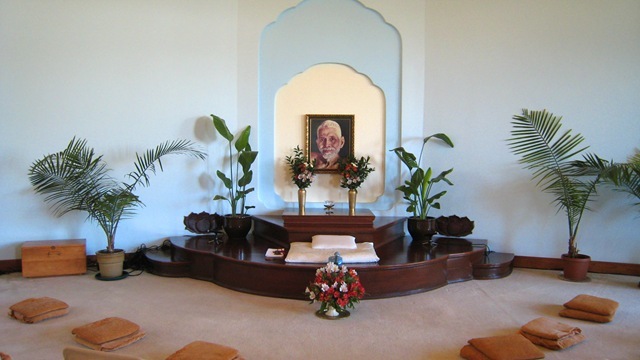 After a year or so of holding satsangs in the large basement of this new facility, devotees attending, including the cats and dogs, decided it was time to build a proper temple, dedicated to Bhagavan Sri Ramana Maharshi. 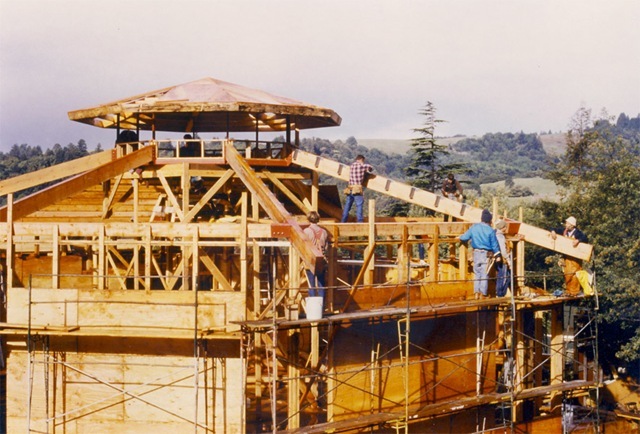 Devotees pooled their resources and skills, their time and their energy, and thus began the creation of the SAT Temple as we know it today. 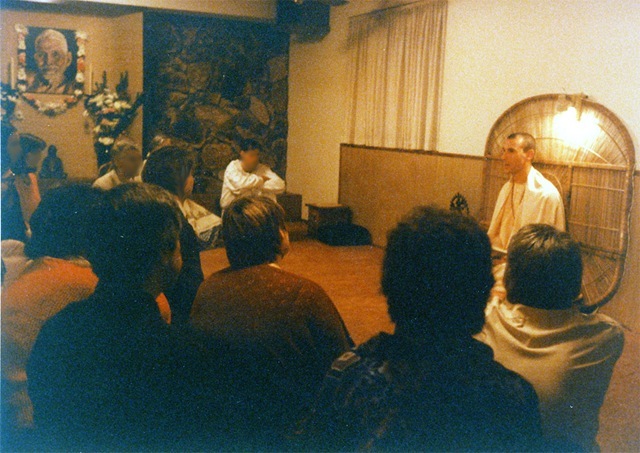 Satsang in the basement of the main house. 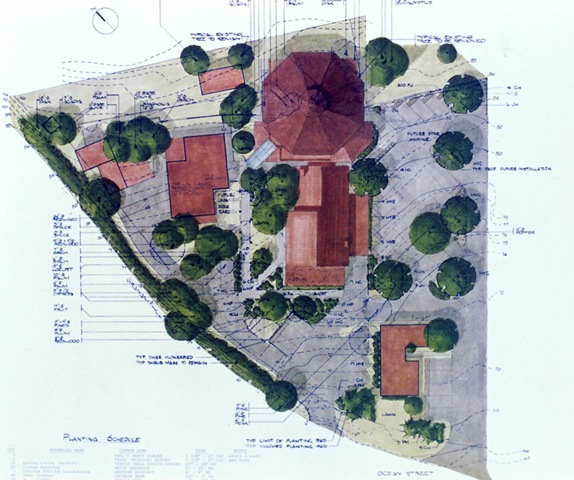 Devotees’ Conception of the New Temple . . . 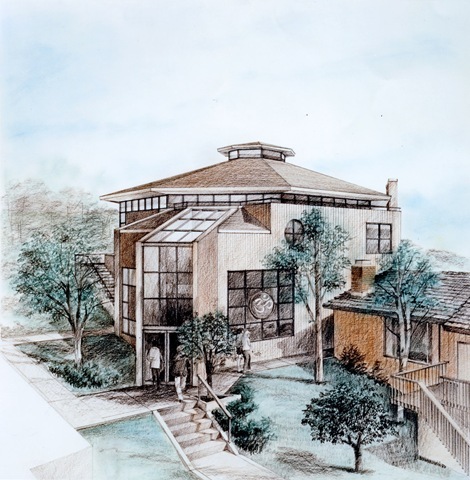 Architectural Conception of the New Temple. . .Hmm! Slightly Different! In the beginning, Brahma created the cosmos, and it was void. 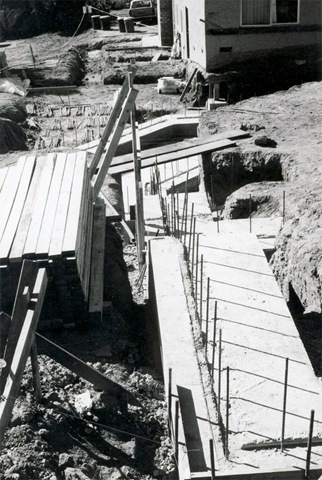 First, the foundation is put into place. . . Discrimination, Detachment, Peacefulness, Self-Control, Renunciation, Faith, Profound Meditation, and the Desire for Liberation. With fortitude and perseverance strength is gained . . .
. . . and the stairway to heaven comes into view. Clearer and clearer the vision becomes. The entrance into the Absolute is paved with Sri Ramana’s Grace and Blessings. 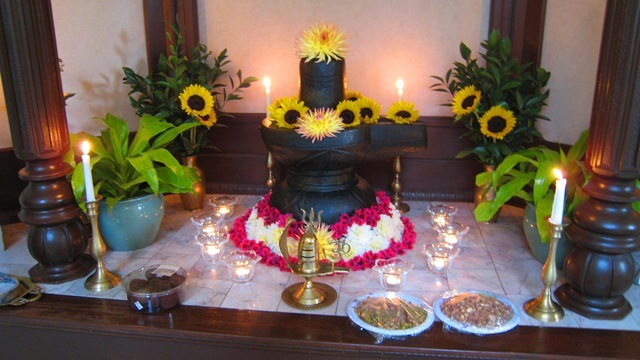 The temple was built by a local spiritual group The Ananda Cooperative along with SAT devotees. Ah, nothing compares to the blissful view of the Self! 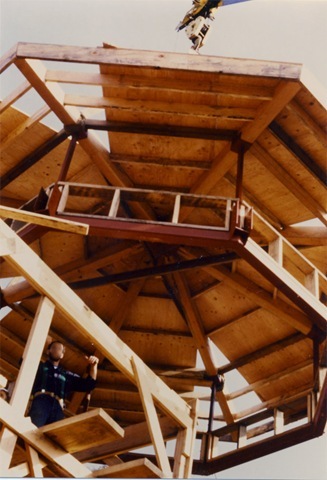 All of the artistic, finished woodwork inside the temple was done by Ramana devotee Doug Acker. 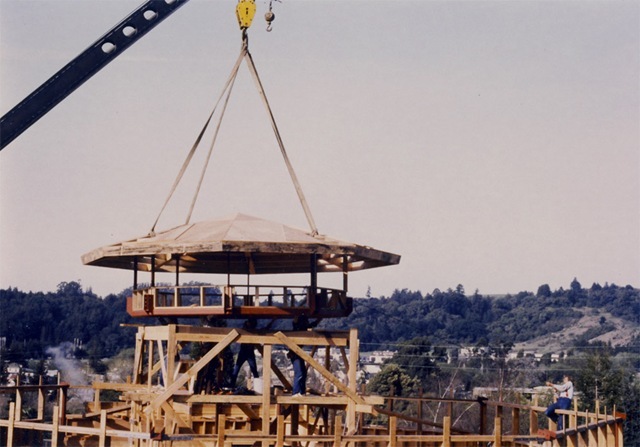 Although the building of the Temple was a monumental undertaking, the underlying Self was the focus all along the way. It was the focus then, and it continues to be the focus now in all that occurs at SAT. 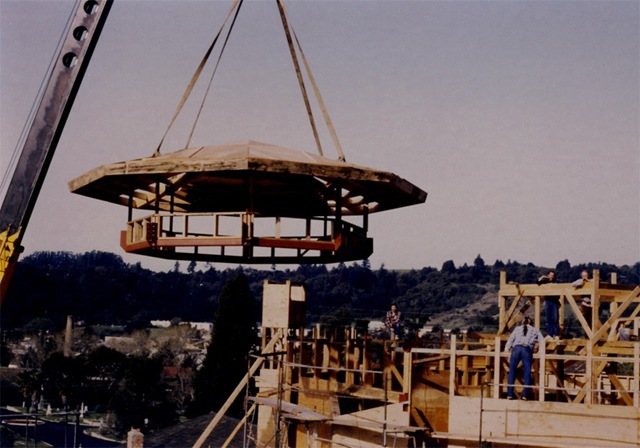 During the time the Temple was being built, The Avadhut Ashram changed its name to the Society of Abidance in Truth (SAT). 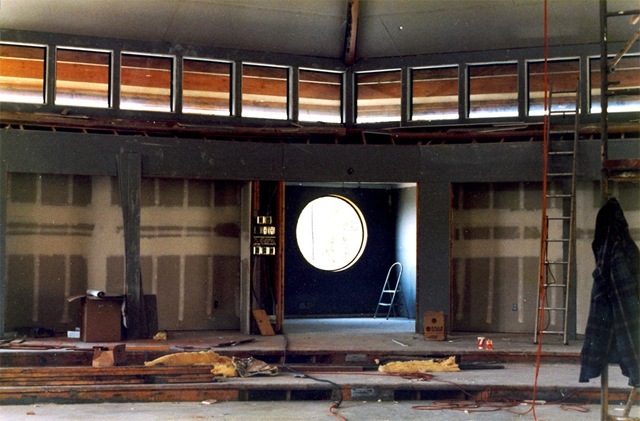 In 1989, the temple was complete, and the SAT Temple opened its doors for the very first satsang on August 20, 1989. 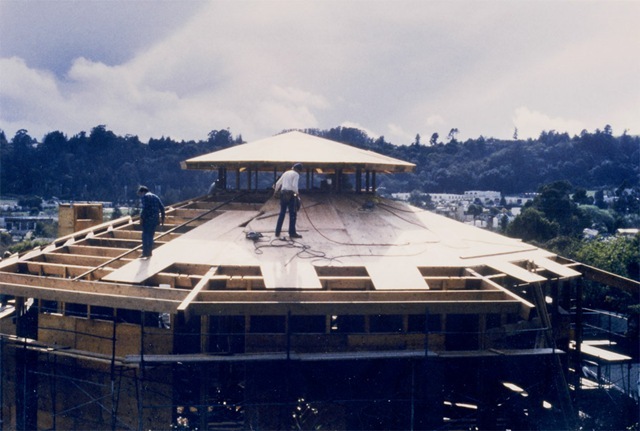 Today, August 20, 2010, marks the 21st anniversary of the Temple opening. Soon after the opening of the temple at the end of 1989 or very early 1990, Nome expressed his intention of translating into English the Ribhu Gita. Sri Ramana read this book and referenced it many times at the ashram. Nome wished to make this book available in English for the very first time. Not knowing Tamil and knowing only a little Sanskrit at the time, he suggested finding someone who was learned in these languages and invite that person to the task of translating this holy text. The search began. 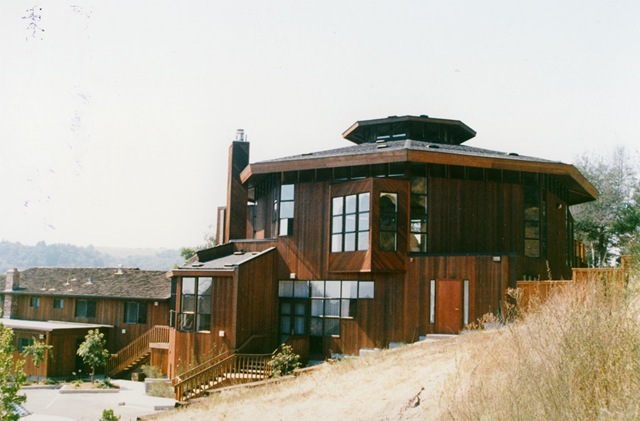 It was not long before SAT heard of a gentleman associated with the Chinmaya Mission in San Jose. His name was Dr. H. Ramamoorthy. Not only was Dr. Ramamoorthy very knowledgeable in Tamil and Sanskrit, he had a doctorate in Sanskrit, a real scholar! And being a lover of Advaita Vedanta, he seemed the perfect match. He would provide the linguistic abilities for the translation, bringing to it his enlightened understanding and knowledge of Advaita and Nome would provide the experience and Realization—who could ask for more?! 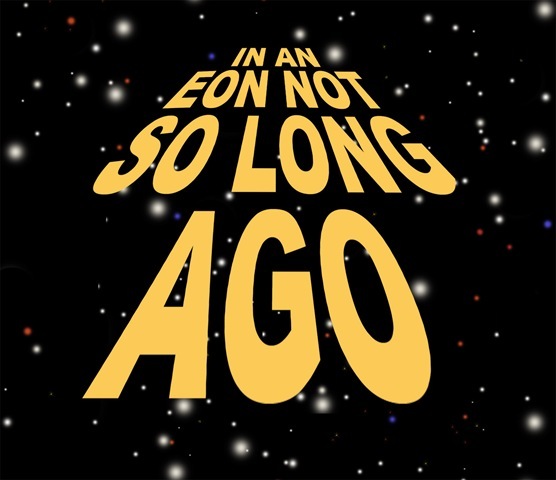 So, it began. First the Sanskrit Ribhu Gita was translated, then the Tamil version, and how about numerous other wonderful scriptures along the way, too! Dr. Ramamoorthy gave himself to the project completely in the most selfless way. For over a decade he and Nome would meet once or twice a week whenever Dr. Ramamoorthy was in the area (he often traveled to stay with family in North Carolina) going over the texts, again and again, until they were perfect. Both worked on the texts between meetings. When Dr. Ramamoorthy. was away, they did the translation work via correspondence. Dr. Ramamoorthy used to say that his meetings with Nome were his own private satsangs! 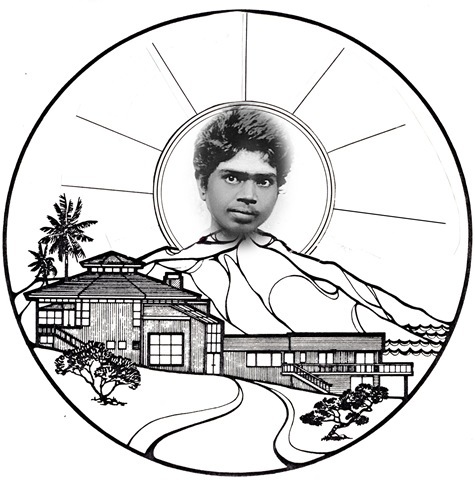 Nome and Dr. Ramamoorthy’s relationship was of divine design. What they were accomplishing together was sublime and of a magnitude incomprehensible to the mind. 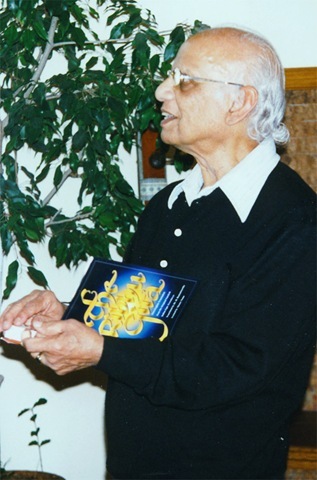 During the 1990’s, SAT published two translations by Dr. Ramamoorthy and Nome. Nirguna Manasa Puja was published in 1992, and the English translation of the Sanskrit Ribhu Gita was published in 1995. During this time, multiple manuscripts were created of many different texts. SAT also reprinted a Self-Realization pamphlet that was originally published by Sri Ramanasramam in the early 1970’s. Nome ordered books from Sri Ramasramam in the early 1970’s and this little pamphlet was included in the book order. All the while, satsangs, retreats, holy events and meditations were taking place at SAT, and devotees were abiding in the heart of Sri Ramana’s Self-Inquiry. Sri Ramana even made it possible for the Temple to procure a Nataraja murti and a Siva linga from Arunachala. 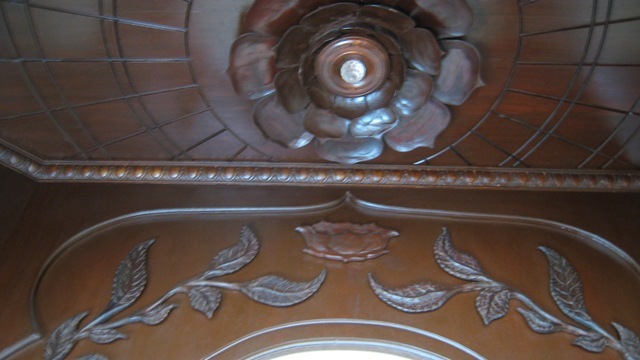 The fine woodwork inside the Shrine Room was done by Doug Acker. In 2001, the Tamil version of the Ribhu Gita, The Song of Ribhu, was released. Dr. Ramamoorthy was frail and ill when he finally returned to California after a long stay in North Carolina. Two days after Nome presented Dr. Ramamoorthy the first copy of the English translation of the Tamil version of the Ribhu Gita, the Song of Ribhu, he entered the hospital, entered a coma from which he did not return and dropped the body a few days later. It was as though he was waiting to see his crown jewel, The Song of Ribhu, before exiting this world and becoming completely absorbed in Brahman. In 2002, Svatmanirupanam, by Adi Sankara, was released. Then in 2003, miracle of miracles, Sri Ramana in His immense Grace, removed all obstacles and blessed SAT with the release of many publications over the next seven years. 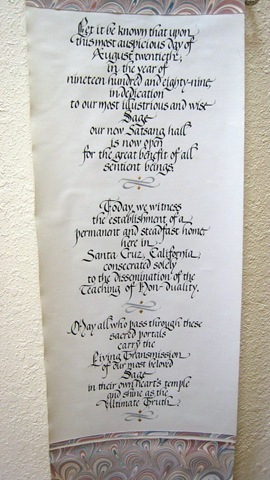 Self-Knowledge in 2003; The Four Requisites for Realization and Self-Inquiry in 2003; Timeless Presence in 2004; Nirvana Satkam in 2004; Essence of Inquiry in 2005 (manuscript of a commentary on Vichara Sangraham written by Nome in 1995, added to later and given to A.R. Natarajan of RMCL to print in 2004); Origin of Spiritual Instruction in 2006; Bouquet of Nondual Texts in 2006; Saddarshanam and an Inquiry into the Revelation of Truth and Oneself in 2009; Advaita Devatam in 2009. 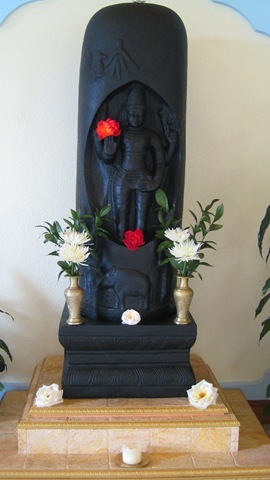 In addition to the release of these texts, Sri Ramana also Graced the SAT Temple with three more murtis! 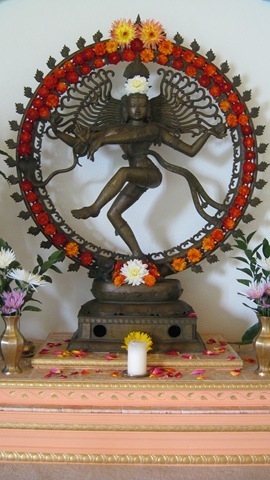 With the kind assistance of Sangeeta and her family, the creation of a Dakshinamurti and Lingodbhava was commissioned in India and brought to the SAT Temple. This Ardhanarisvara was seen in a Bangalore shop during SAT devotees’ 2005 pilgrimage to India. 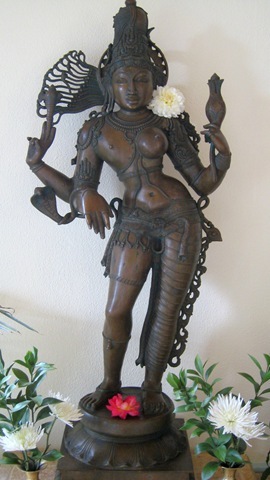 Shortly after their return, arrangements were made to procure this murti. By the Grace of Sri Bhagavan, countless satsangs, meditations, retreats, and special events have been held here, the effect of which fills the atmosphere of this entire holy place. 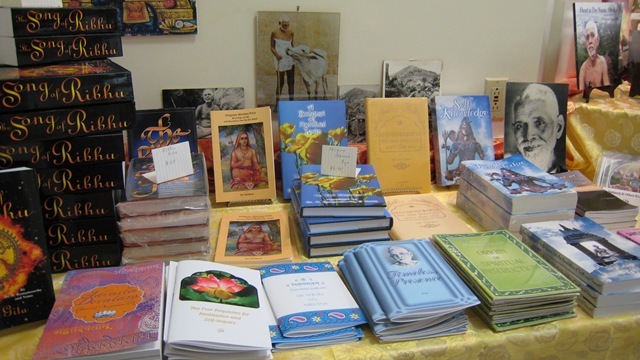 During this time, SAT published over 14 books on Advaita Vedanta. Books were translated, written and published here at the temple. All the time, satsangs, retreats, holy events and meditations are taking place at SAT, and devotees are abiding in the heart of Sri Ramana’s Self-Inquiry. The highlight of SAT though, has always and will always be exactly what the acronym SAT means and what it has always been about — SAT— Being. Often holy places are significant because of their proximity to the holy ground or holy river at which they are situated. 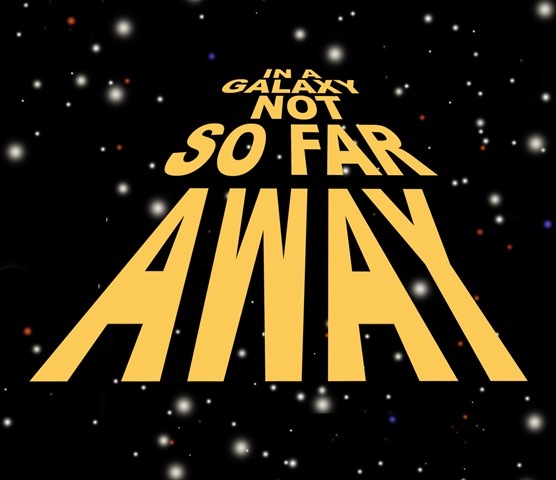 Although the SAT Temple is located in a relatively small, insignificant town, on a small planet, in a small galaxy, in a vast universe, SAT is locationless. At the SAT Temple it is the silent space itself that is holy. People who visit the SAT Temple tend to recognize, in their own experience, the silent vastness of this space of Consciousness. SAT is formless Being transcendent of anything of the world. We welcome you to visit SAT. Nirvana-satkam (Six verses on Nirvana), by Adi Sankaracharya, verse 6. Translated into English by SAT. Thank you Bhagavan Ramana for this holy space! This is truly a wonderful post. Thank you so much!!! 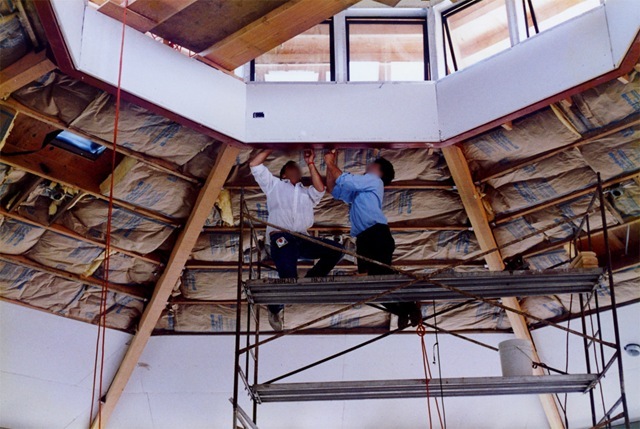 Tons (literally depicted in photos) of Inspiration ! The high quality review and also the light-hearted narrative tone were very natural in the sacred context of the photos. With love in the heart, praise on the lips and sharing words through the fingers cannot actually be perfect enough, nor need they for the message to be perfect. Precious portraits, humble gratittude. My wife Lindsey and I have truly enjoyed our two trips to SAT thus far. The satsangs with Nome were very enlightening. It is inspiring to see how much grace was poured forth by the divine in order to bring such a manifestation into existence. For the time being we listen to Nome’s recordings daily and look forward to our next trip to SAT.